Waiting at the Highway 20 signal on North Albany Road. Is the Albany Police Department reviving its motorcycle patrols? 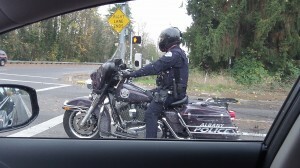 That’s what I wondered on Friday when I was driving into town and followed a cop on a motorbike on North Albany Road. But, alas, it isn’t so.